Eggs are a big part of my life. The other day, at the store, while buying eggs, Mike said something to me about being crazy about eggs. He was referring to how I like to be super careful while buying them – I basically cradle the carton like it holds breakable liquid gold. The cashier overheard and was like, “What? You’re crazy about eggs?” Then we got into a whole discussion about how much I love eggs and he suggested I buy the 30 pack. My response was, “is it on sale?” Of course they weren’t, so it was just a 12 pack instead. I’m a little obsessed with eating pasta with eggs. It’s something about the way the egg yolks break and form a delicious sort of sauce – it gets me every time! 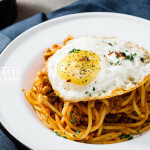 Spaghetti and eggs always reminds me of all those brunches I used to eat with my parents on Sunday, when I was a kid. We’d go to a HK cafe and get toast and eggs or macaroni in soup. I’d always beg for us to order the house special spaghetti with an egg on it. I guess some things never change because I still love spaghetti with an egg on top. It’s even better if you add a crispy fried egg instead of a regular sunny-side up – I love the lacy, crunchy edges you get when you fry eggs at a high heat. Hope you guys are brunching! In a large stock pot, heat up 1 tablespoon oil over medium high heat. Add the onions, carrots, and celery. Deeply brown, about 15 minutes. Remove from the pot and set aside. In the same pot, heat up the remaining oil over medium heat. Add the garlic and red pepper flakes and cook for 2 minutes. Add the meats and brown over medium-high, 15 minutes. Add the vegetables, crushed tomatoes, bay leaves, and thyme. Bring to a boil and lower to a bare simmer for 1-2 hours, or as long as you can. If the water level gets low, add a couple of tablespoons of water. When finished, discard thyme and bay leaves, taste and season with salt and pepper. Cook the pasta according to the package, drain and toss with enough bolognese sauce to coat. Keep warm in the pot. Heat up oil in a heavy bottomed skillet over medium-high to high heat. Crack an egg into a small bowl. 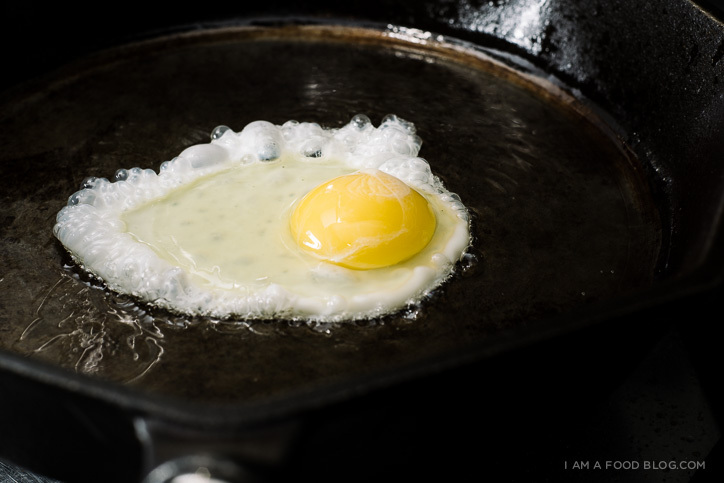 When the oil is hot and shimmery, gently add the egg to the hot oil. There will be a lot of bubbling and crisping action going on. Keep an eye on it and when it’s done to your liking, remove from the pan. Repeat with the remaining egg. Put some pasta on your plate, top with the egg and garnish with red pepper flakes and flat leaf parsley. Enjoy hot! PS – Happy Thanksgiving to all my Canadian friends! My brother and sister-in-law are making turkey tonight and I’m SO excited! PPS – Don’t you just love the linens? They’re from StitchNY and they’re handmade in a tiny apartment in NYC by Blair, who is trying to fund her design thesis. I am especially in love with the navy with the sunburst stitch, which I featured in this post, but the stripes are gorgeous as well! Hop on over to take a look! First, this pasta. Yum. 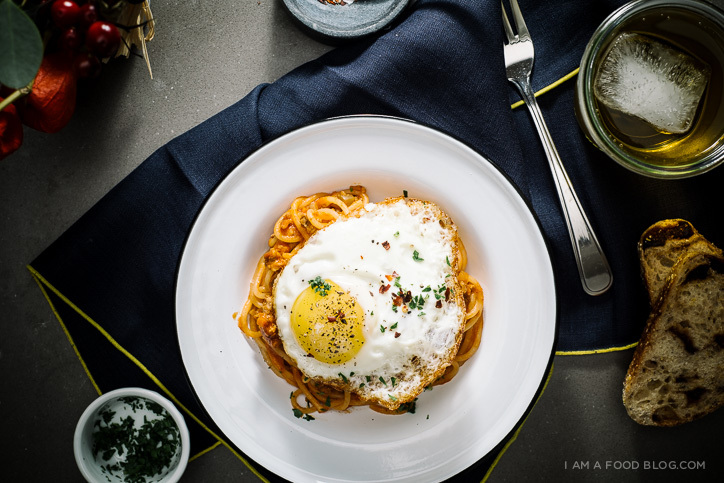 I love adding eggs (especially to carbonara or aglio olio) for that delicious decadence! Have a great day Stephanie! I bet eggs over chicken parmesan would be pretty neat. Although eating eggs with chicken always makes me feel sort of weird. It’d be like eating beef with a side of veal. Conceptually, anyways. Although I have no problem eating roe alongside fish, which is also sort of the same thing. I actually don’t really know where I’m going with this, ignore me. so can i start calling you egg girl?? :) :) i love that this is inspired by a hong kong cafe. when i was in hk, there were two places that i’d go to for a fluffy egg sandwich. once i also got macaroni soup! so good and comforting. okay, this is totally what I want for breakfast now. Happy Thanksgiving! Love this! Fried egg over pasta is my favorite solo dinner/lunch. You’re totally right about the yolk making a delicious sauce. I usually just pair it with olive oil, sea salt and Sriracha to save effort. I’ll have to try your version soon. I’m very much the same… egggggggsss. My man calls me ‘eggy’. This looks super delicious and I am SO making this. I love eggs on top of anything, if it’s savoury – put an egg on it! i’m crazy for eggs too and usually end up putting them on everything, so this dish is right up my alley. 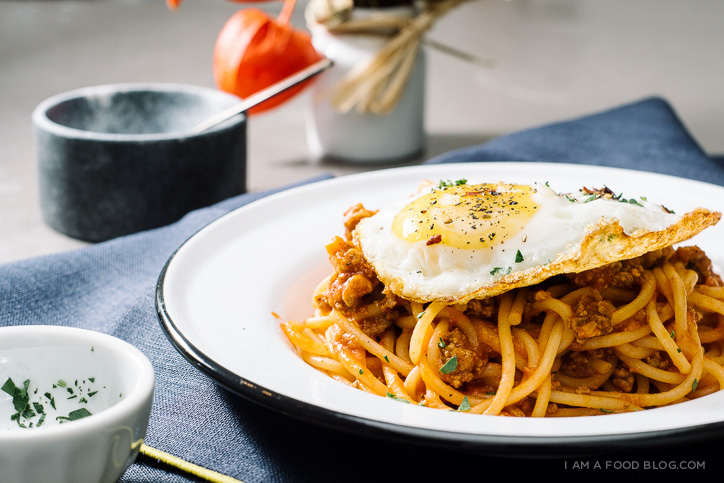 i love the combination of spaghetti + meat sauce (which always reminds me family) with the crispy egg. happy brunch! Why I’ve never had an egg on my spaghetti is beyond me because that makes total sense!! P.s. Happy Thanksgiving!! 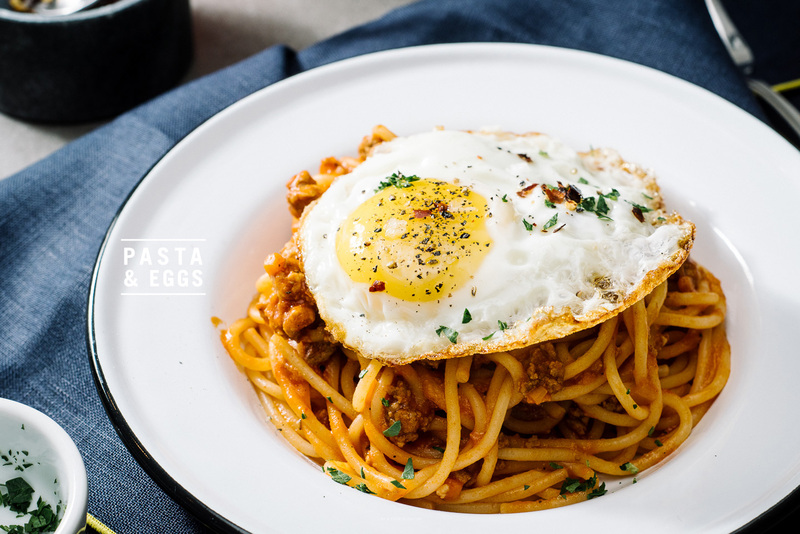 I’ve never had spaghetti with egg, so this is quite refreshing! It looks like an easy recipe, so I might try this at home. :) thanks for sharing! Great idea! 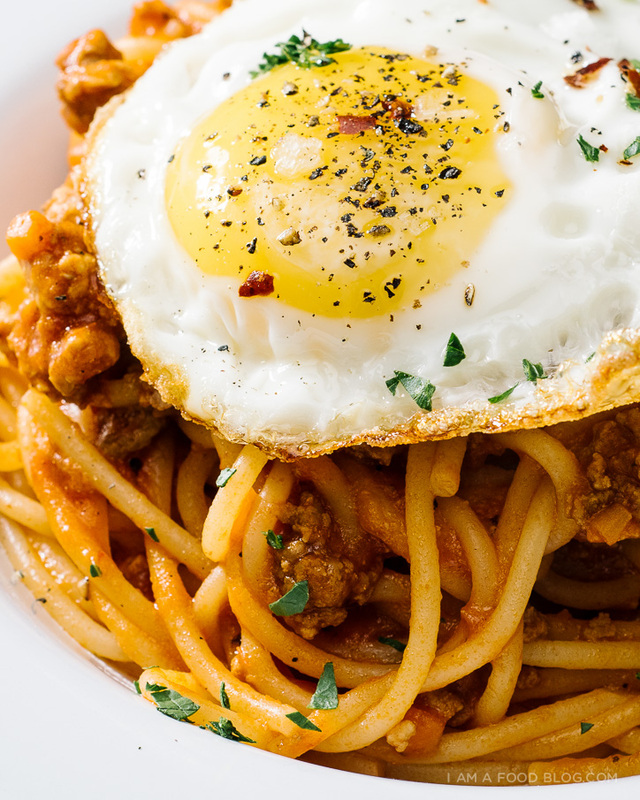 I’ve been known to eat chili with a fried egg on top, but for some reason spaghetti with an egg on top has never happened at home. Time to change, that, obviously. We are egg obsessed at home, too – I think I have 3 12-packs in my fridge right now. If a 30-pack were an option at my bodega, I’d probably have one of those. What is the trick to get a crispy lace edge to your eggs….. please do tell – should the egg be room temp or cold? I do them cold, straight from the fridge into a screaming hot pan with lots of oil. Hope that helps! Wow this looks amazing. Right up my alley. I LOVE eggs and pasta and this is a winner. Will convince my Mom to make this. We’re gluten-free and dairy-free but she’ll tackle this recipe and make it yummy, as I’m sure it was delish. Thanks! Eggs are in fact, the best. I heart the idea of mixing up brunch with spicy pasta! So beautiful with a dripping egg yolk. That´s luscious, succulent, mouth watering! I´ll try this comming Sunday. I also LOVE crispy fried eggs with oozy yolks! There’s nothing better. Ive never thought of these two thing put together. it looks so delicious i want to try it myself. I absolutely love spaghetti it has to be my number one favorite food. I also enjoy eggs like a lot so this forsure is something i am going to try. what a lovely idea!!! Never had that for brunch, but feel really tempted to try it out. This Looks beautiful! I must give this a go! I might have to put an egg on my spaghetti every time from now on. I am an egg addict. Nobody was happier than me when the egg on top of everything trend started. Pasta/noodles holds a very close second place in my heart, so the combo of this is only natural to me. I can’t wait to try this! This is like the best blog ever. Recently, my fiance and I just love cooking carbonara Jamie Oliver style and sometime we do it more like a scramble egg on the side. We never thought to cook a sunny side up. I bet having a soft boil egg would be delicious too.